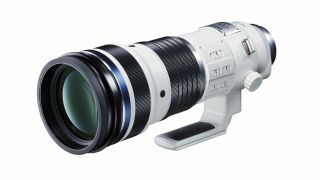 Coinciding with the reveal of the Olympus E-M1X, the mirrorless giant has announced a new super telephoto lens and converter that deliver an astounding 2000mm maximum zoom – perfect for the pro sports and wildlife market being targeted by the ‘reimagined’ flagship. The M.Zuiko Digital ED 150-400mm f/4.5 TC1.25x IS Pro, to give its full name, is a super telephoto zoom with an equivalent 300-800mm range in 35mm terms. If that weren’t impressive enough, it features a built-in 1.25x teleconverter that extends its maximum focal length to an equivalent 1000mm (while reducing the widest aperture to f/5.6). The 150-400mm f/4.5 is part of Olympus’ Pro series of lenses, which feature optimum image quality, compact construction and market-leading robustness, being dust, splash and freezeproof. It also boasts in-lens image stabilisation and supports Olympus’ Sync-IS technology; when combined with the 5-axis in-body stabilisation of the E-M1X, this delivers a remarkable 7.5EV stops of stabilisation. Also announced was the Olympus M.Zuiko Digital 2x Teleconverter MC-20, which doubles the focal length of its master lens. When attached to the new 150-400mm f/4.5, it becomes a staggering 2000mm equivalent. Factor in the 7.5 stops of stabilisation afforded by the E-M1X, this promises unprecedented handheld telephoto shooting potential. The MC-20 boasts the same weatherproofing as the Pro lenses, and will also be compatible with the Olympus 300mm f/4.0 and 40-150mm f/2.8 optics. In addition to doubling the telephoto range, it doubles the maximum shooting magnification as well – paving the way for tantalising macro possibilities. While the MC-20 teleconverter is set to be available later this summer, the 150-400mm f/4.5 lens isn’t due to arrive until 2020.